Feel free to request passages in other translations and we will add them. Scripture Memory Fellowship (SMF) is an exciting ministry based in Hannibal, Missouri, which recently has branched out to embrace, endorse, and support other Scripture memory ministries and tools, while still using their trademark systematic Scripture memory rewards system started by founder Dr. N.A Woychuk (originally began as "Bible Memory Association - BMA"). The director of SMF, Jim Woychuk, has contacted us to offer prizes to those who have memorized verses on Memverse. SMF will mail a free book to everyone who has memorized at least 200 verses on Memverse! Additional free books will be mailed when Memverse users reach 500 verses, 1,000 verses, 2,000 verses, 3,000, and every thousand after that. SMF will give a $100 gift certificate to CBD or the Bible Bee e-store (or other appropriate Christian enterprise) for anyone who reaches 10,000 verses on Memverse and another for every 10,000 after that. The first one in SavedByGrace's group to memorize all 31,173 verses on Memverse will get a brand new car...just kidding about the new car, but thanks to SMF you will have a library of wonderful free books and $300 of gift certificates by the time you finish. This post will be updated as more titles will be added to choose from. Those who have memorized 500 or more verses may claim multiple books at the same time. For example, if you are currently at 1,143 verses, you can receive 3 books (1 for 200, 500, and 1,000) and contact SMF for a 4th book when you reach 2,000 verses. In addition to the book awards, SMF is also awarding a free week of SMF summer Scripture Memory Camp to 5 Memverse users each year who have memorized at least 500 verses on Memverse. If you have memorized 500 verses on Memverse and are interested in possibly attending the SMF camp this upcoming summer of 2012, please contact SMF. They will let you know when the dates and locations of the camps have been finalized. You will then have 2 weeks to confirm that you want to go, or your spot will be made available for another Memverse member with 500 verses who wants to go. If more than 5 request the free week of camp scholarship, a waiting list will be started. Those on the waiting list who do not get to go in 2012 will get first chance at the scholarship the following year. To contact SMF for the free books or the free week of camp, or to get more information about these offers call (573) 231 - 0577 M-F between 8:30am and 5:30pm CDT or email smfi.77@gmail.com or mail them at SMF 245 N. Levering Ave, Hannibal, MO 63401 or stop in person to the Hannibal headquarters or see the SMF booth at the Bible Bee Nationals in Nashville in November, or home school fair in your area. We will update this list with any new locations or possible cancellations. When you contact Scripture Memory Fellowship for your reward, you will need to give your name, your age (for those under 18), your Memverse user name, the books you selected, and the address you want the books mailed to. You can learn more about SMF at www.scripturememoryfellowship.org. This summer, I had predicted that we would hit 100,000 verses on September 15th, 2011. Obviously I was wrong. However, I am hardly discouraged as it is so exciting to see so many new people using Memverse and seeing regulars reaching new heights and staying faithful with the Scripture. It is also very inspiring to read all the passion for God's Word on Memverse that stands in sharp contrast to what we often encounter off Memverse. Our main focus on Memverse is always knowing, loving, worshiping, and serving the true, Living, Biblical God better and better through memorizing, meditating on, and obeying His Word. However, I think there is room in our goal to encourage and inspire each other as we meet different milestones here on Memverse. So what do you think? When will we hit 100,000? You can make one prediction on the "Original guess" chart. You can also update that guess as many times as you want on the "Latest guess" chart. I will record up to 3 names for each date on each chart. Will you be the first to predict the right date? A big thanks to Julie of scripturestickies.com who is increasing the fun and adding prizes to those who guess the right date. I wonder who will have the honor of memorizing verse #100,000. Please join us in praying for each Memverse user as we memorize and interact with God's Word. Also pray for Andy, Alex, and Emeka as they keep working to improve Memverse. Exact date you think we will reach 100,000 verses on Memverse? October 17, 18, 19, 20, 21, 22, 23, 24 28, 31 are full and cannot be joined unless someone leaves that date. Hello everyone! I love what you guys are doing here on Memverse as you memorize God’s Word and encourage each other. This contest looks like a lot of fun! A few years back, I started a ministry called Scripture Stickies to help people memorize and meditate on God’s Word. 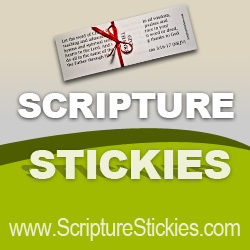 Scripture Stickies are stickable Bible verses and they are a fun way to help you study verses. They also make great gifts. If you think you have a good prediction, feel free to start looking for your favorite Scripture Stickies pack now on my website, www.scripturestickies.com. To claim your prize, call me at 1-888-202-4007 or email me at info@scripturestickies.com or mail me at 405 El Camino Real #434 Menlo Park, CA 94025 with your username and the address you want me to mail your Scripture Stickies to (also tell me which pack you chose and what version of the Bible you prefer). Alternatively, if you will be at the Bible Bee Finals in Nashville – and if 100,000 verses has been reached by then - you can pick up your prize in person at the Scripture Stickies booth. - SavedByGrace memorized 100,000th verse on October 19 at 15:57:42 UTC! Even though the main emphasis of Memverse is, and always will be Scripture memory verses; we also want to encourage and inspire all forms of treasuring, taking in, and meditating on Scripture in our pursuit of knowing, loving, praising, and serving the true Biblical God. After a hectic July with haphazard Bible reading mostly developing a worshipful heart through PSALMS, Jacky and I decided to start August with a disciplined, yet flexible and grace filled daily joint Bible reading goal and plan that we might be able to continue throughout our married life together. God enabling us, we want to read together at least one chapter of the Bible each day. We will read through 5 sections of the Bible. The Old Testament (minus PSALMS and PROVERBS); PSALMS, PROVERBS, the Gospels, ACTS - REVELATION. Rather than be tied down to a certain number of daily chapters, we are using target dates we are aiming for to complete each section. Two days before the end of each month is the target date for reading through one Gospel. Two days before each 4th month is our target date to complete PROVERBS; Two days before the end of each 6th month is our target date to complete PSALMS and to complete ACTS - REVELATION; July 29th each year is our target date to finish the Old Testament. We plan to supplement our daily devotional reading with periodic longer Scripture reading sessions where we read several chapters from one of the 5 sections. On this blog we plan to declare our monthly Bible reading as an accountability help for us and, Lord willing, an encouragement to others. We also invite others to likewise share your reading plans or goals and/or declare your weekly or monthly or yearly (or periodic) Bible reading. This blog can also be used to discuss any specific Scripture you have recently read. Please always feel free to share testimony or insights on the Scripture we declare as reading. May we always remember that quality time in Scripture and a right heart for God always trumps quantity of chapters read or verses memorized. I look forward to hearing from you as we encourage and inspire each other. PS If we have interests in others committing to monthly declarations of Bible reading we can set up a friendly monthly "Remember to declare your Bible reading" post on this page or monthly email sent out to those who desire to be included. On August 27, many of you competed in Local Bible Bees across the United States. On Wednesday, August 31, those of you in the National track learned whether you will be traveling to Nashville for the National competition as a competitor. Today, you're probably either getting ready for a more intense competition or going back to "normal" life. Either way, we want to congratulate you for your diligence in memorizing Scripture! Every hour we spend now establishing a more fervent walk with our gracious God through family discipleship, Scripture memorization, and prayer is of great value and can change the course of our lives and the lives of those around us for God's glory. Paul reminded Timothy in 1 Timothy 4:8 that "physical training is of some value, but godliness has value for all things, holding promise for both the present life and the life to come." We do not memorize merely for information, but we seek the truth of God's Word because it is a "lamp to our feet and a light for our path," a comfort to our souls, the Sword of the Spirit we need to kill sin in our own lives, and the way to truly knowing Him. When the Bible Bee competition ends for you, we pray you would find the beginning of a new chapter in your life filled with the grace of God through Scripture memorization and intentional time spent with Him. (Dakota challenges us about how Christians should budget time here.) Consider memorizing a book of the Bible to see how verses and chapters fit together with the larger scope of the book's theme. Some are memorizing 1 Peter to give themselves a fuller understanding of that book which they studied over the summer while preparing for the Bee. This is a great choice. You can check out that project. ... the high peak of Scripture, however you look at it. Luther called it "the clearest gospel of all." "If a man understands it," wrote Calvin, "he has a sure road opened for him to the understanding of the whole Scripture." Tyndale, in his preface to Romans, linked both thoughts, calling Romans "the principal and most excellent part of the New Testament, and most pure Euangelion, that is to say glad tidings and that we call gospel, and also a light and a way in unto the whole Scripture." All roads in the Bible lead to Romans, and all views afforded by the Bible are seen most clearly from Romans, and when the message of Romans gets into a person's heart there is no telling what may happen. If this is true, we should seek to understand Romans and memorize it. To see a wonderful calendar for memorizing Romans from September 1, 2011, through December 31, 2012, please choose a file format: PDF or DOC. (Courtesy of the Alexander family - thank you.) At one verse a day, with separate review days built in, you can memorize Romans in just over a year. We are also planning to hold a few more Bible Bee Live Quizzes before this marathon is over. We would like to hold at least one with verses you studied for the Local Bee targeted at all Bible Bee participants, regardless of whether you've qualified for Nationals. Please check back sometime next week when we will have more information. Update 09/05: We have determined dates for six more Bible Bee Live Quizzes. On each of these dates we will hold a quiz (and maybe a re-run of that quiz) starting at 4:00 p.m. EDT — except for November 11, which begins at 4:00 p.m. EST. Please see below and mark your calendars! This post will be updated before each quiz with a link to it. We hope you can attend one or more quizzes. If for any reason we need to cancel a quiz, we will do our best to let you know as soon as possible. The first quiz will contain material from what was studied for the local competition, so as to allow anyone in the Bible Bee to participate (some Primary, Junior, and Senior verses), but after that we will focus on verses for the National qualifiers with some review from earlier material. Packer, J. I. Knowing God. Downer's Grove, Illinois: InterVarsity Press, 1973. Print. ROMANS 12:15 tells us to "Rejoice with those who rejoice..." Here at Memverse we want to do that in congratulating any Memverse members who become Bible Bee Finalists!! Please help me out as we attempt to find and list them all on this blog page. We will also set up a new accountability chart to help encourage anyone who wants to memorize the extra 161/261/361 (including the 61 verses in 2 PETER) verses the Bible Bee Finalists will be memorizing or studying in getting ready for "Nashville in November". All are welcome to join this chart even if you, like me, will not be competing in the November contest. Regarding 2 PETER, you can treat those verses however you want. I would encourage contestants to consider memorizing the entire book to be best ready for the contest. However, you may also declare them as "fully studied but not memorized" and we will still count it on this chart. May we also be sensitive to Bible Bee participants who did not make the list of finalists. ROMANS 12:15 ends with "... mourn with those who mourn." The obvious truth is that being one of the finalists has little to do with how much God will use His powerful Scripture in your life in the years to come. May we stress this and be gracious in our conversation on this blog. A through T Primary Accountability Chart. Each declaration = 8 verses. A through T Junior Accountability Chart. Each declaration = 13 verses. Matthew M TX A B C D E F G H I J K L M N O P Q R S Thank you and CONGRATULATIONS for completing this chart of 261 verses. You are in Jacky and my daily prayers as you sharpen all 700 verses for Nashville and study 1 and 2 PETER. More than that, we pray that God will speak powerfully in your life as you meditate on His Word and keep and treasure many of these 2011 Bible Bee verses for years to come. Kaitlyn V MI A B C D E F G H I J K L M N O P Q R S Thank you and CONGRATULATIONS for completing this chart of 261 verses. You are in Jacky and my daily prayers as you sharpen all 700 verses for Nashville and study 1 and 2 PETER. More than that, we pray that God will speak powerfully in your life as you meditate on His Word and keep and treasure many of these 2011 Bible Bee verses for years to come. Carissa P MO A B C D E F G H I J K L M N O P Q R S Thank you and CONGRATULATIONS for completing this chart of 261 verses. You are in Jacky and my daily prayers as you sharpen all 700 verses for Nashville and study 1 and 2 PETER. More than that, we pray that God will speak powerfully in your life as you meditate on His Word and keep and treasure many of these 2011 Bible Bee verses for years to come. Nicolas A OH A B C D E F G H I J K L M N O P Q R S Thank you and CONGRATULATIONS for completing this chart of 261 verses. You are in Jacky and my daily prayers as you sharpen all 700 verses for Nashville and study 1 and 2 PETER. More than that, we pray that God will speak powerfully in your life as you meditate on His Word and keep and treasure many of these 2011 Bible Bee verses for years to come. A through T Senior Accountability Chart. Each declaration = 18 verses. Bethany P MO A B C D E F G H I J K L M N O P Q R S Thank you and CONGRATULATIONS for completing this chart of 361 verses. You are in Jacky and my daily prayers as you sharpen all 1,100 verses for Nashville and study 1 and 2 PETER. More than that, we pray that God will speak powerfully in your life as you meditate on His Word and keep and treasure many of these 2011 Bible Bee verses for years to come. Stephanie Hills FL A B C D E F G H I J K L M N O P Q R S Thank you and CONGRATULATIONS for completing this chart of 361 verses. You are in Jacky and my daily prayers as you sharpen all 1,100 verses for Nashville and study 1 and 2 PETER. More than that, we pray that God will speak powerfully in your life as you meditate on His Word and keep and treasure many of these 2011 Bible Bee verses for years to come. Seth W MO A B C D E F G H I J K L M N O P Q R S Thank you and CONGRATULATIONS for completing this chart of 361 verses. You are in Jacky and my daily prayers as you sharpen all 1,100 verses for Nashville and study 1 and 2 PETER. More than that, we pray that God will speak powerfully in your life as you meditate on His Word and keep and treasure many of these 2011 Bible Bee verses for years to come. A great way to learn Bible memory verses is through Scripture songs. This blog is to share with others Scripture songs you write and Scripture songs you find. We would love to hear from you. What great Scripture songs have you found or written that you can share with us? In these tough economic times, I know I’m not the only one who’s realized the need to create a weekly budget to help keep me on track financially. Without a definite course charted out I often find it difficult to stay motivated and am very liable to spend a little bit more money than is appropriate on unnecessary things, such as eating out and texting. In the same way, it’s often necessary for a Christian to budget their time in order to maintain a close relationship with God. If you are regularly missing out on prayer, Bible study and church due to a supposed lack of time, then consider putting your facebook account on hold for a while and reprioritizing your schedule. Put God first and make everything else revolve around His place in your heart. We are once more approaching 1,000 active users and this time I believe that we, Lord willing, will make it. How exciting when according to the "one church" leaderboard chart we had not even cracked 500 as recently as June 2010. One easy way to tell your friends may be to forward the recent August Memverse newsletter you received to your friends. To encourage us to pass the 1,000 active user mark I am setting up a "My friend signed up in August" chart. If someone you told about Memverse signs up (or has already signed up) this month, please let us know on this blog. Please also let us know if you are the one who signs up in August and remember who told you about Memverse! I realize an over emphasis with numbers can be dangerous. It is possible for us to have 1,000,000 active users and not have right hearts before God! Let's not get out of balance. On the other hand, as a math teacher and a coach for 20 years I love numbers and am excited about the motivation we can receive as we see other like minded believers memorizing Scripture with us and dream big God-size dreams of what He might do through His Word and truth in our lives. Can we get more than 10 people to help a friend sign up for Memverse this month? At last count, we recovered from our nose dive and set a new record of 994. Many thanks to everyone who spread the word about Memverse at your local competition. It would be very cool to get over 1,000, even if it is only temporarily before we dip again, before we eventually surpass 1,000 for good!! Who will you refer today? A group of Memverse members, led by SavedbyGrace, have started a new Scripture memory group committing to memorizing the entire Bible in their lifetime! Wow!! What a great goal and use of the mind and life God has given us. It is exciting to see the impact the National Bible Bee is having on so many young people in the USA. May God's blessings be on the group as you get to know the Living God better and better through His Word and as you commit to keeping these Bible Bee memory verses for the rest of your life and even adding more in your pursuit of memorizing the 31,103 verses in the Bible. I have never met anyone who can quote the entire Bible and will be thrilled to be praying for each member of this group as you proceed. We at Memverse want to encourage you in any way we can. If you want to join this group, please let SavedbyGrace and his friends know through this blog post. This is also the place to make any comments about memorizing the entire Bible, and/or encourage this group. SavedbyGrace or others in the group will be editing this page in the near future to give more information. Please let us know if we mistakenly list you twice, or if you no longer want to be on this list. Rachel, a committed Memverse member, has started a group of people committing to memorizing 1 PETER. Very cool. I will let her update this page to include information on how the program works. When the Bible Bee local competition is over, it would be neat to set up an accountability chart here for memorizing 1 PETER. It would also be very cool to run a 1 PETER Live quiz or 2 either while we are memorizing or after we are done. There are now 20+ people in the group. If you would like to join us in memorizing 1 PETER with the group, please let us know. Please let us know if you no longer want to be listed or if you were listed twice by mistake. Please be active in praying for members in the group as we take in this exciting book. We don't want to accountability chart people to death. However, we also want to give an outlet for people who are memorizing 1 PETER. Group leader "Jesus Paid it All" has set Jan 31st, 2012 as a target date to finish, giving time to Bible Bee Finalists to finish after Nashville. However, people are welcome to keep memorizing and declaring after that date. There are 105 verses in this awesome book, so we will make each declaration = 5 verses. We will welcome and post single, double and triple declarations as we understand that some have already been memorizing 1 PETER. We ask you to refrain from declaring more than 15 verses at once, but rather return back for future declarations. Declarations can be made from any parts of 1 PETER since we know some are not starting with 1:1. We would love for you to join us!! Can we, Lord willing, get all 37 on, or better yet to eventually complete this chart? Rachel C NC A B C D E F G H I J K L M N O P Q R S T U have finished the 1 PETER chart. CONGRATULATIONS! I pray that God will use 1 PETER powerfully in your life for yours to come. Thanks for encouraging all of us with this group! Eunice S IND A B C D E F G H I J K L M N O P Q R S T U have finished the 1 PETER chart. CONGRATULATIONS! I pray that God will use 1 PETER powerfully in your life for yours to come. Great to see India involved with memorizing this wonderful book. I can't wait for God to open the door for me to, Lord willing, one day visit India. Jo B UK A B C D E F G H I J K L M N O P Q R S T U have finished the 1 PETER chart. CONGRATULATIONS! I pray that God will use 1 PETER powerfully in your life for yours to come. Great to see England involved with memorizing this wonderful book. I pray that more and more people in England will treasure and memorize Scripture and praise God for the historical legacy England has in our Christian faith. Reset Schedule - this is a button that appears on the 'Memverse Today' tab of the home page when you have fallen behind in your memory verse review. Pending Verses - this allows you to set verses to an 'Inactive' status. First, there are two definitions that you should understand. Target Time - This is an option in your profile menu where you specify how much time you would like to spend memorizing each day. Required Time - This is the time that Memverse calculates you need to spend each day to not fall behind on the memory verses you are currently working on. to determine whether new verses start as 'Pending' or 'Active' when you add them. The 'required time' is used in determining whether your verses are 'Active' or 'Pending' as outlined above. It is also used to determine when to give you the option to reset your schedule. The 'Reset Schedule' button will appear when the number of verses you have due on any given day is more than 3x your 'required time'. For example, if your current required time is 10 minutes per day but you have 35 verses due for review that day, you can reset your schedule. Memverse will reschedule the verses into the future in such a way that you will have about double your required time for the next while. If you are finding that you have too many verses to review each day but you are never seeing the 'Reset Schedule' button, then it's because you quite simply have too many active verses and you should convert some of them to 'Pending'. Take a look at the required time that Memverse thinks you need. If you don't think you can allocate that amount of time each day to memorization, you should reduce the number of verses you're working on. These probably aren't the best settings for those of you who are working towards the Bible Bee competition but you can share your settings in the comments below. The Friday, July 15, Bible Bee quiz will be at 4:00 PM EDT on a new part of the site for live quizzes. We are still working on this but wanted to have something to try out for the first time publicly. If you can join us, that would be great! Questions will be from Week 6 (with one exception) and will be about 2/3 Primary verses. We hope the quiz will go faster with the automated system. As you prepare for the quiz, please take a few minutes now to upgrade your browser. This is very important as we are using newer technologies that are not compatible with some older browsers. Also, please make sure that the Bible version you have set in your Account Profile is the Bible Bee version you want to use for the quiz. While you're there, you may want to take your version out of your display name as this will no longer be necessary. If you have any questions, please let us know. To enter the quiz room, please click here. There is not much to see until we start. At 4:00 PM EDT we will start the quiz, but please make sure you arrive early so you can participate. It seems that the software does not handle late arrivals very well... If you cannot make the beginning of the quiz, you should at least have the page open on your computer so that you can jump in when you are available. Hope you can attend! Thanks. The concept of Bible Bee quizzes on Memverse seems to be quite popular. :) Please mark your calendars and spread the word about upcoming quizzes: Friday, July 8, at 4:00 PM EDT; Friday, July 15, at 4:00 PM EDT; and Friday, July 22, at 4:00 PM EDT. I plan to lead the first quiz on this blog post (materials will be from Week 5, mainly Primary verses with a few Junior as well); the later two quizzes will each probably have a separate blog post to run on and other volunteers will probably run them. Update: Bethany will be running the July 22nd quiz and we are still looking for anyone who would like to run the quiz on the 15th. :) Thanks. If you plan to be participating in the first quiz or have any questions, please indicate that in a comment below (unless you have already done so on the other blog post). I also welcome any suggestions. Hope to see you there! Thanks. [T]he Church exists for nothing else but to draw men into Christ, to make them little Christs. If they are not doing that, all the cathedrals, clergy, missions, sermons, even the Bible itself, are simply a waste of time. God became Man for no other purpose. It is even doubtful, you know, whether the whole universe was created for any other purpose. Lewis, C.S. Mere Christianity. New York: HarperOne, 1980. Print. May our study of Scripture be diligent and may it lead others to Jesus. If we are keeping it to ourselves, it is tragically a waste of time. But if we are doing it for God and letting the Truth influence every area of our lives so that others are being drawn to Him, it is because He has begun a work in us that He will continue to use for His glory (Phil 1:6), and that is no waste! Keep it up, all! Thanks to Christian Alexander for catching a scoring mistake I made: I was giving 15 points maximum for references. This should be fixed now. If anyone else notices any errors, please let us know and we will work to rectify it as quickly as possible. Thanks.